The information contained on this page is intended to help you to become familiar with certain sales procedures and policies of our company. It is our goal to making doing business with the Security Product Depot easy and hassle free. We want you to be a satisfied customer! To achieve this it is important to have a thorough understanding of this information and the associated procedures. This will be helpful in developing a good long standing business relationship between your company and ours. The part number from the companys catalog or website may not match the one on your package or shipping label. When referencing a part number, SKU, or product number with our customer service department always reference the catalogs or websites respective part number. All Prices subject to change without notice. All orders will be billed at prices in effect at the time of shipment. MasterCard, Visa, Discover and American Express cards are accepted for purchases. Ship time is usually between three and five business days. Lock, door hardware, and electronic products will be shipped by UPS surface or carrier of our choice. If another carrier is requested, order is to be F.O.B. shipping point regardless of dollar amount. For safe and fire-proof file cabinet purchases; the size and weight of your safe or file cabinet purchase will determine the shipping method. 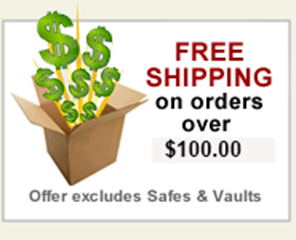 Safe and fire-proof file cabinets shipping time is usually between five and ten business days . All safes and file cabinets weighing 85 lbs. or less will be shipped via UPS or carrier of our choice. Safes and file cabinets will be insured for up to $100.00 value. Any additional insurance can be provided at an additional cost to the customer. All safes and file cabinets weighing in excess of 85 lbs. will be shipped via truck to your destination of choice inside the continental United States. Safes shipped via truck will arrive to the specified address and will be lowered to the ground by the trucking company at no additional charge. This service does not include moving the product up or over any stairs or steps. The trucking company is only supplied with a hand truck and a pallet jack, so the inside distance is limited to their equipment. IMPORTANT: All safe deliveries must be signed for at the time of delivery; therefore the customer must be present. The trucking company will not leave a safe or file cabinet if no one is available to sign for the shipment at the delivery address. The trucking company will also charge a redelivery fee of $30.00 or more depending on weight, which will be payable by the customer. ALL SAFES AND FILE CABINETS MUST BE INSPECTED AT THE TIME OF DELIVERY for any damage that may have occurred during shipping. All damages must be noted prior to signing the freight bill; otherwise you will be unable to return the safe or file cabinet. If the safe or file cabinet is damaged the customer MUST REFUSE DELIVERY. If you keep the safe your only recourse is to contact the freight carrier for compensation. Back orders are placed only at the request of the customer and therefore considered a separate order. Because of this, freight will be charged according to our freight policy regardless of the size of the order from which the back order is taken. These are non-stock items ordered from regular vendors at the customer's request. A non-refundable deposit of 50% will be required and Special Order items are not returnable. Returned merchandise must be unopened and in good condition. Merchandise may not be returned without our prior approval and the issuance of an assigned Returned Goods Authorization Number (RGA Number). This can be achieved by contacting our customer service department at our main office. All returns must be made within 15 days of purchase and the original invoice number will be necessary to process the credit. When returned, goods and their cartons must be in perfect unused, re-saleable condition and may not be marked on in any way. All returns are subject to our inspection and approval and a reasonable handling charge. Returned merchandise is subject to a minimum 20% restocking service charge. Non-stock, special goods or items fabricated, modified, or cut to size per order are not returnable. All products should be free of defects in material and workmanship and to perform the work for which they were designed. Any defective merchandise will be returned to the factory for their inspection. The appropriate disposition (credit, replacement, or repair) of this merchandise will be made based on the factory's recommendation. No deductions from payment will be allowed until a formal credit has been issued from our accounting department. Any merchandise to be returned must be sent prepaid to our office. Refunds will be via crediting the purchasing card credit or a refund check depending on the original purchasing method. Refunds will usually be within 30 days of cancellation or returned of goods. For NSF checks there is a $45.00 Charge. Late Fees 2% per month on past due invoices over 30 Days. All claims for shortage and/or damage must be reported within 5 days. If any shipment is lost and/or damaged by the delivering carrier, it is the purchaser's responsibility to file the appropriate claim forms with the delivering carrier. All products are warranted to be free of defects in material and workmanship backed by the manufacturers full warrantee. All products are warranted by the manufacturer. The period of time the products are warranted are determined by the manufacturer. This warranty does not cover any labor costs for installation, removal and/or re-installation of the product being serviced or replaced under warranty. This warranty is strictly limited to product repair or replacement by the manufacturer. Any defective product under the manufacturers warrantee will be referred to the manufacturer for deposition. Security Product Depot is to serve as a liaison between the buyer and the manufacturer or supplier. Any product authorized to be returned by the manufacturer will be assigned a RGA number by Security Product Depot and returned to Security Product Depot. All products are subject to manufacturers inspection. Security Product Depot, its employees and agents make no claim that purchasing or following any or all of Security Product Depot or the securityproductdepot.com website recommendations or product solutions guarantees in any way that your residence, property, facility and/or business is burglary-proof. Implementation of our common-sense recommendations only improves your chances that an intruder or thief will find your residence, property or business unsuitable for break-in or attack. The company is not responsible for typographical, omissions, and other errors.